Back in September I was upset. My youngest daughter, Naomi, was assigned the strictest teacher for first grade that I'd ever encountered. She had rigid classroom rules. Naomi had to make journal entries each night in addition to several pages of homework. Most first graders in her school could barely write more than 2 sentences, and all this work felt like torture. We even considered switching her class, and other parents did move their kids out of the class. After a long adjustment, Naomi got used to the work load and even won an award for most improved student. She and her classmates each presented an oral report to the parents that her principal declared was a fifth grade assignment. 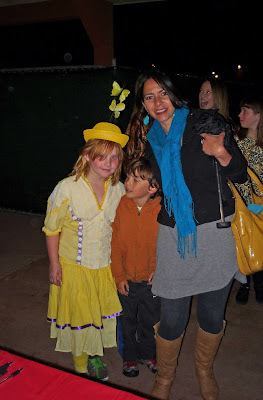 In April we invited all the teachers to see the girls in "Seussical", and Ms. Chavez was the only one who showed up, even though it hailed that night (here in San Diego that's way too much like the sky is falling to venture outside!). Now she's the first teacher Naomi's had in California to arrange a field trip for the kids. They're going to the Aquarium and Naomi can't stop talking about it! I'm so glad I didn't switch her from this class, and I'm beginning to realize that many teachers are so strict because they really care. Last weekend we went to our friend, Jason Hite's, art opening up in Hollywood. My younger 2 kids were at a sleepover so we just brought Chloe. It was a late night, but it was nice to get out without ALL the kids. Jason was a recent guest on our radio show and happens to be a very talented sculptor. 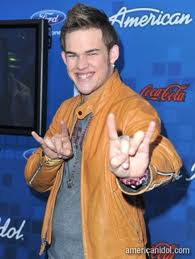 Chloe and I weren't properly draped in shear black clothing like most of the women from the Hollywood crowd that showed up, but we were in absolute awe when James Durbin, a recent contestant from American Idol walked through the door. I was feeling pretty bashful, as people you feel you "know" from TV tend to glow in a surreal way, but then I saw Mike just walk up and start chatting him up like he's known him for years..... So I walked over and said "hi". He seems like a nice guy. He's rehearsing in Hollywood this month for the big world tour. Apparently I'm not even as tall Ryan Seacrest (yes, I asked, I just had to know!). It's such a strange thing living around here where all these people from TV are just walking around living their lives. Don't they know they're supposed to be imaginary?!!! It's a wonderful thing when a teacher really cares. Unfortunately it seems that some teachers don't go into education for the right reasons anymore. I'm glad your daughter got a good one! I'm glad the teacher worked out. Have a great weekend.